Need a break? Need to relax? You need a backyard environment. For over 35 years, we have been helping Dallas residents find peace in their backyards. Let us build you a backyard environment. Welcome to Fences and Decks Dallas! We build backyard environments with fences, decks and more. We are expert craftsmen who build beautiful patio covers, decks, arbors, pergolas and shade structures, all types of wood fences and wrought iron fences, automatic sliding gates, balconies, screened enclosures and gazebos. We bring our expertise into your backyard and work hard to bring your outdoor space to life. 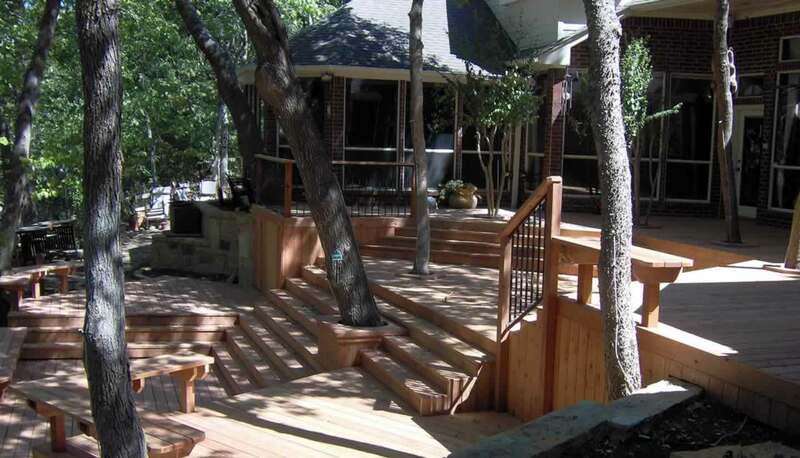 Fences and decks have been our specialty in the Dallas Metroplex since 1980, and we have gained a solid reputation for our honesty, reliability and quality workmanship. We are experts at building custom privacy fences, wrought iron fences, wooden & composite decks, arbors, pergolas, wood patio covers, balconies, deck covers, screen rooms, automatic driveway gates, gazebos and more. Take a look through our gallery and enjoy our blog to be inspired by some of the projects our clients have commissioned from us. From a patio cover, wooden deck or fence through an automatic slide gate, we have perfected it all and have thousands of satisfied customers who have all extended their outdoor living space and created their own backyard environment. Let us help you design and build your own backyard environment! For the best prices on a fence or deck and getting the most from your outdoor space call Fences & Decks Dallas (972) 272-0554, or contact us on our website for a free, no obligation quote.